Whether the recipient of this package is an Arizona Native or an International Tourist, this joke is sure to provoke a memorable reaction. We always know when someone in the store has found the Rattlesnake Eggs! These are an ideal humor gift, and the prices are such that they can be called a cheap thrill without it being a joke. 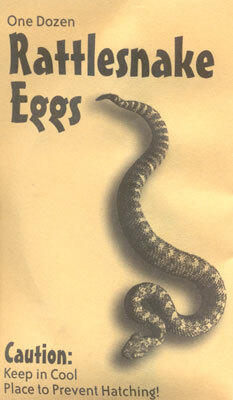 Frequently, shoppers wish to purchase more than one envelope of Rattlesnake Eggs. As long as the shipping address is the same, we can work with you to keep freight charges down. We offer Rattlesnake Eggs in Packs of 5 and 10. Need a Custom Order? No problem, pardner! If you have a custom quantity of ice scrapers that you want to order, please contact us via email. We'll be more than happy to work out the deal that's right for you!